There is still a need to collect undocumented 4-Pack color combinations. If you have a 4-Pack that is not featured, please share it with the M.U.S.C.L.E. community. Submissions can be sent to the University of M.U.S.C.L.E.. Thank you in advance for all submissions! 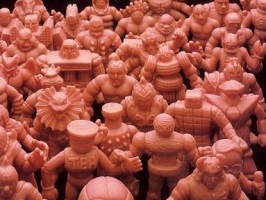 If you have any figures that you would like added to the Frankenstein-like Amalgam Figure section, then please send them to the University of M.U.S.C.L.E. with a brief explanation and pictures of the figure. Thank you in advance for all submissions! If you have any counterfeit packaging that you would like added to this section, then please send them to the University of M.U.S.C.L.E. with a brief explanation. Thank you in advance for all submissions! This subsection section of Art 300 attempts to collect all the know fan art. If you have any fan art that you would like featured, then please send it to the University of M.U.S.C.L.E.. If you have any pictures that you would like featured, then please send them to the University of M.U.S.C.L.E. with a brief explanation of the pictures, plus how the children learned about M.U.S.C.L.E. toys. This entry was posted on Thursday, March 10th, 2011 and is filed under Art, Fashion, History, Research, Sociology, UofM News. You can follow any responses to this entry through RSS 2.0. You can skip to the end and leave a response. Pinging is currently not allowed. Epilogue – Week of March 20th | University of M.U.S.C.L.E.